After ten days of repeated attempts, MSF finally managed to deliver medicines and medical supplies yesterday to the town of Sirte, which is currently at the heart of ongoing fighting in Libya. According to doctors in the town, the healthcare situation in Sirte is deteriorating. “They say that their hospital is overrun with wounded and they aren’t always able to respond to other gynaecological or paediatric emergencies, or treat people suffering from chronic conditions”, said Dr MégoTerzian, emergency response co-ordinator for MSF. “They also have to deal with cuts in power and water and a lack of urgent medical supplies. They need anaesthetics, antibiotics, analgesics and blood for transfusions”, she added. Initially, due to the fighting, the MSF team based in Misrata could only deliver medicines to a small town 10km away from Sirte. 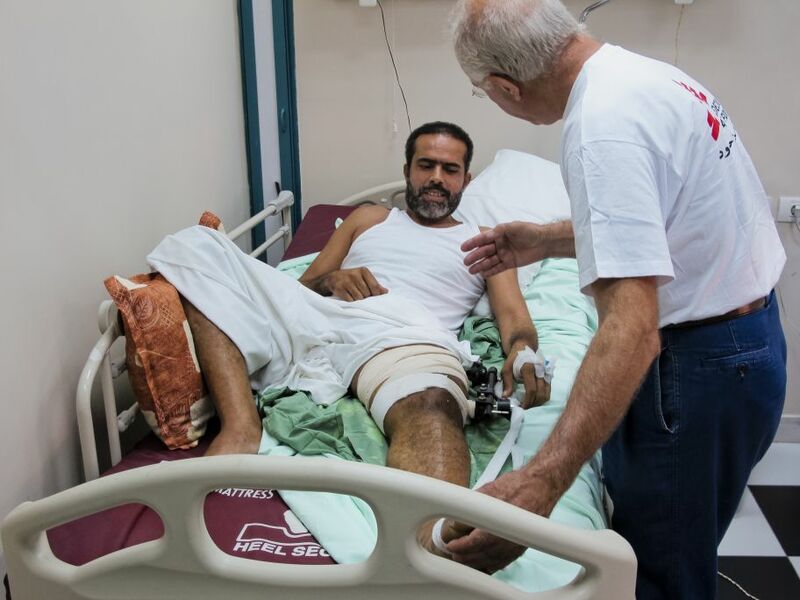 Since 3 October, MSF has managed to send medicines and medical supplies to Sirte itself, notably an oxygen concentrator and wound dressing materials. Emergency treatment has been taking place at medical health posts close to the front lines of Sirte and Beni Walid. MSF is supporting a medical health centre set up in an old holiday home, 50km from Sirte with logistical support, medicines and medical supplies and first aid training. Once patients are stabilised at this centre, they can be taken by ambulance or helicopter to Misrata or Tripoli where the closest hospitals with surgical capacity are located. In the Kasr Ahmed hospital in Misrata, an MSF surgical team looks after the urgent and wounded cases. It also looks after prisoners of war who are being detained in local prisons and moved to this hospital for surgical operation. Another consequence of the fighting which is taking place on both sides of Misrata is that civilians are fleeing the strongholds of the old regime, such as Sirte and Beni Walid. Some are heading to Tripoli and others are seeking refuge around Misrata or joining camps for internally displaced people in Kaddayia, Al Hicha, Wachka. MSF is monitoring the situation in these camps to ensure medical access for these displaced people. Notably, the town of Al Hicha has opened a camp for 2,000 people where MSF is supporting the Libyan doctors by providing medicines. MSF has teams in hospitals in Yefren and Zintan in the west of Libya, where they are providing medical supplies and drugs. MSF is also providing mental health support to people affected by the fighting. In Misrata, MSF is providing medical care, including post-operative care, in many prisons in the town and offering mental health support to detainees, mostly soldiers who have been taken prisoner. In Misrata, MSF psychologists play a supervisory role and give training to Libyan psychologists. They are also holding consultations within the community. Finally, medical consultations, mental health care and the distribution of essential goods make up the various kinds of aid being offered to migrants sheltering in sites in Tripoli and around.